Jamaica has always been a sun- and fun-seeker’s paradise. 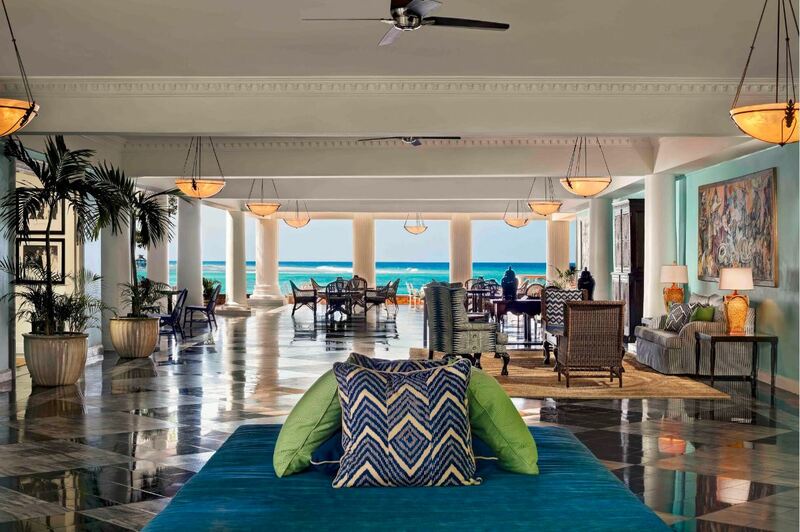 The Caribbean’s third largest island, Jamaica is known for beautiful beaches and friendly people, music, rum drinks and of course…resorts that truly deliver on the promise of luxury. It’s here, surrounded by lush tropical beauty, where you’ll find the luxury resorts that attract discerning guests, be it celebrities or people that just like the star-studded treatment! This old world, luxury hotel was recently upgraded and has attracted the royals – the Queen of England has stayed here – along with other celebrities from around the globe. Guests looking for privacy can choose a private villa escape complete with cook/housekeeper and butler service. There are 31 unique and charming villas at Half Moon to consider. Don’t be surprised if you wander past Iman or Spike Lee in the lobby; not everyone chooses a villa hideaway. There are plenty of other superb accommodation options to choose from on the property including 197 rooms and suites, with 12 guest cottages, complete with private pools. Dining options are lovely and plentiful on the property, from the Seagrape Terrace where breakfast, lunch and dinner are served to Italian dining at Il Giardino to a Jamaican BBQ lunch served daily on the beach (jerk chicken, pork and fish along with sweet potatoes). For a memorable dining experience choose The Sugar Mill, adjacent to the 17th-century water mill, featuring a farm-to-table menu. 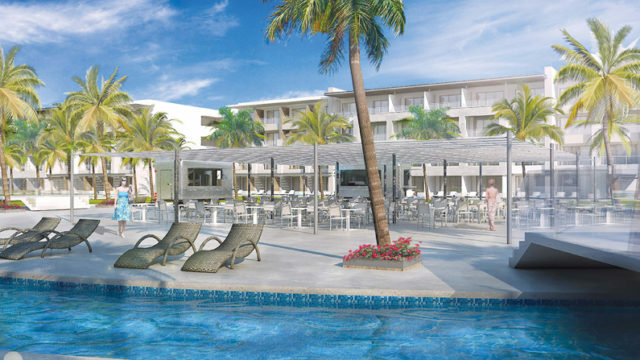 The restaurant is headed by Christopher Golding, Chef De Cuisine (named Best Chef in Jamaica). In total there are 7 bars and 5 restaurants to choose from. Activities at the resort range from horseback riding and tennis to golfing at the world-class Robert Trent Jones Sr. designed course. The Fern Tree Spa is a popular spot to indulge in centuries-old healing treatments with Jamaican influences. Guests with children would appreciate the Anancy Children’s village where kids are cared for by trained staff, giving mom and dad even more luxury and relaxation. This is not an all-inclusive resort but you have the option to buy a package to include your meals and bar service in your room. Some activities are included while others are available at an extra charge. When you have 400 acres of property, a state of the art fitness facility, and two miles of beachfront, there is absolutely no fear of lack of things to do. 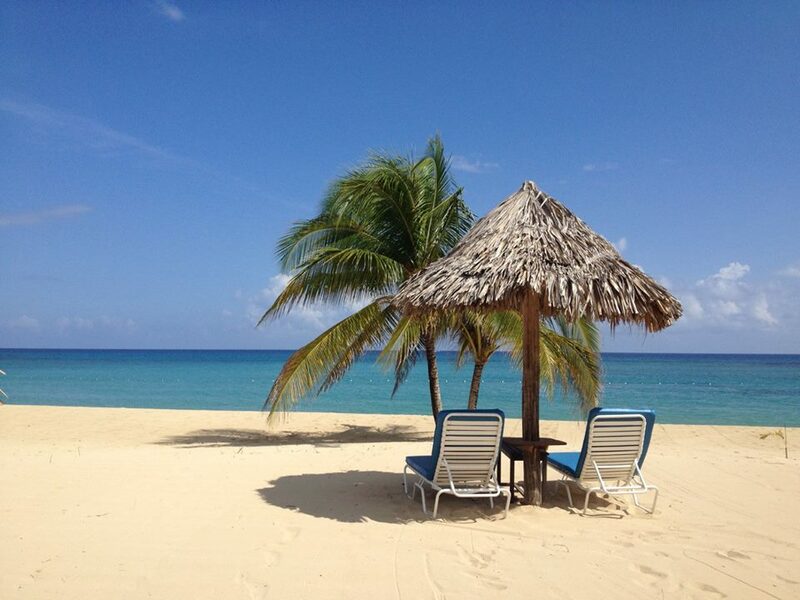 Take wonderful food, elegant accommodations, top service and undisturbed relaxation…add a beautiful beach, calm serenity and natural beauty and you have arrived at the Jamaica Inn. All this in an amazing setting; situated on 700 feet of Caribbean shoreline, this is an understated elegant hotel suitable for any discerning traveler. The accommodation (suites and cottages) have spacious verandas and balconies with incredible views. Rooms are comfortable and elegantly designed with all the luxuries you would hope to find. What you won’t find is a TV, clock or radio, rowdy beach parties with blaring music or cookie-cutter meals. There is snorkelling, sailing, and kayaking as well as an oceanfront spa and stunning scenery. Dining options abound, they offer breakfast only or all-inclusive plans if you want to dine on the property. The food is truly amazing. This is your destination for peace and tranquility. Take note, it’s not a hotel that caters to children so it’s not suitable for young families. 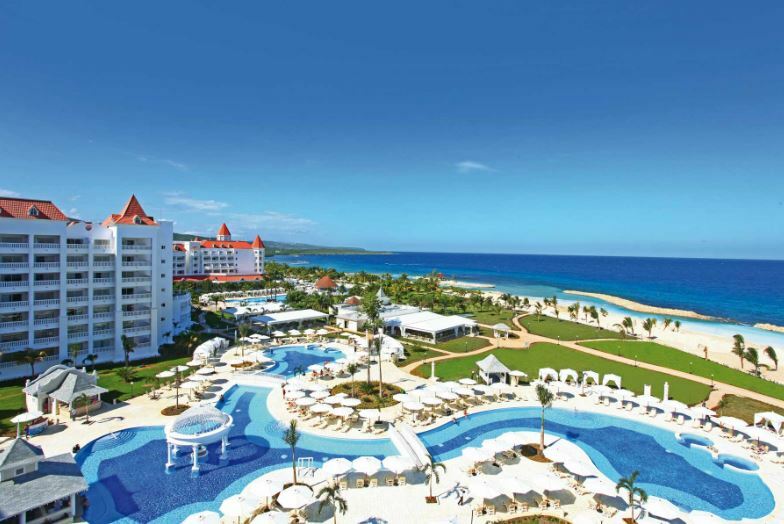 One of the top ten, all-suites Jamaican resorts, The Grand Bahia Principe Jamaica (800 rooms) is a great place to vacation if you like an all-inclusive with a large, beautiful beachfront property. The rooms all have air-conditioning, a mini-bar, TV, telephone, balcony or terrace. The resort has 7 bars, particularly good buffets with lots of variety, as well as a la carte restaurants which are wonderful and always sold out, so remember to book any a la carte dinners you want on arrival. This award-winning resort is an ideal family destination. There’s always a lot to do with nightly entertainment (disco, karaoke bar, piano bar) and daily activities like snorkelling, windsurfing, catamaran sailing, kayaking, beach volleyball, tennis, introductory scuba lessons and of course swimming – in its 3 pools. If you want to get away from the many activities, just relax and rejuvenate at the luxurious spa. If a day on the links appeals, there’s a golf course just 5 minutes away. Kids are VIPs here and have their own ‘Kids Club’ for ages 4 – 12. There’s an awful lot of activity at the all-inclusive Palladiums! The Grand Palladium Lady Hamilton side of the resorts is quieter and more upscale with a little something extra on every corner, including an adult pool, private beach and warm, charming staff who use every effort to make your stay special. They have a lovely entrance and a smooth check-in. The Lady Hamilton has over 500 large and lovely comfortable suites, including 48 villas. The rooms have air-conditioning, TV, phone, ceiling fan, bottled water, bathrobes and a separate sitting area. The complex has 13 bars, 3 buffets and 7 a la carte restaurants (Italian, Mexican, Asian, Indian, Barbeque and a Grill). Not to be left out is the Jerk Hut at Sunset Cove. The Blue Lagoon restaurant overlooks the main pool with open-air seating and a generous buffet. When it comes to activities, they cover all bases starting with the incredible pools, one being the largest you’ll find in Jamaica. There really are too many activities to list, with lots to do for all ages including an arcade/game room, on site miniature golf and a lovely playground for the children. If you’re going to use the beaches, water shoes would come in handy as some shells and coral bits can be sharp. All in all this is a beautiful resort with beautifully accommodating staff. 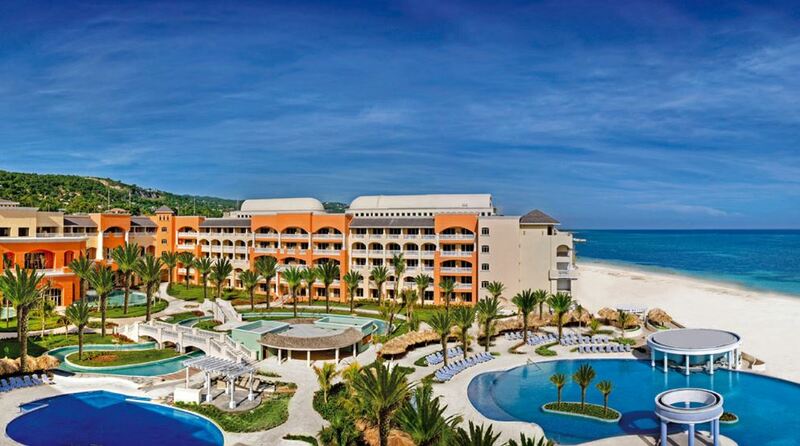 The Grand Experience at Iberostar Grand Rose Hall is total luxury in a super seductive atmosphere. The grounds and gardens are stunning. 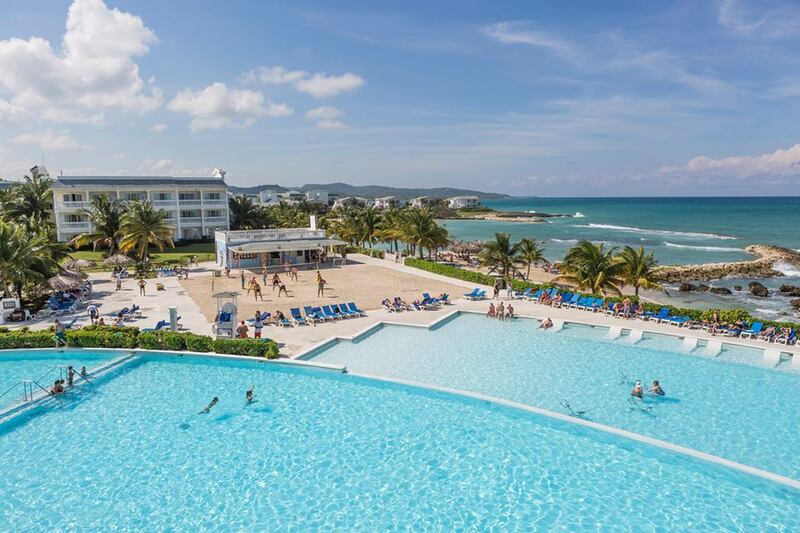 This is not the spot for young families nor is their sister hotel next door (Iberostar Rose Hall); it’s an adults-only 5-star bit of Jamaican paradise close to Montego Bay. They have 189 Grand Suites with sea or garden views as well as 104 with direct beach access, and 2 stunning Presidential Suites. Each room has a king bed, European linens, and marble bathroom with hydro-massage bath. There is a coffee maker, high-speed Internet access and a well-stocked mini bar. The Grand has many dining options, like the lovely Beach Buffet and several a la carte restaurants (Japanese, Mediterranean, Mexican and French). 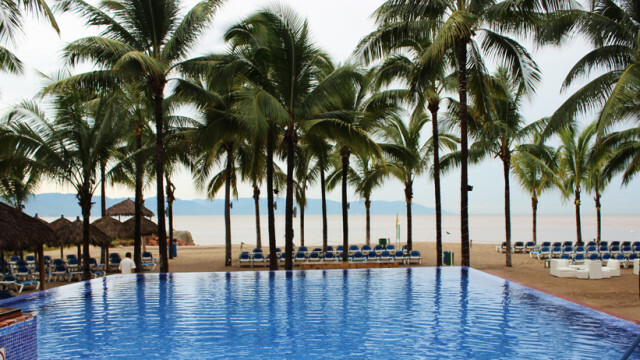 They have a beautiful pool with a swim-up bar and draped poolside cabanas as well as an on-site casino. For activities, they have a gym with cardio equipment and yoga, Pilates or tai-chi, dance lessons, basketball, pool volleyball, tennis and watersports like catamarans, kayaking, snorkelling and windsurfing, all included with your stay. If that isn’t enough, you will find golf, zip-lining, river excursions, jungle hikes, boats and para-gliding close by. The staff are top notch and charming, including the excellent maids and butlers who just can’t seem to do enough for their guests. 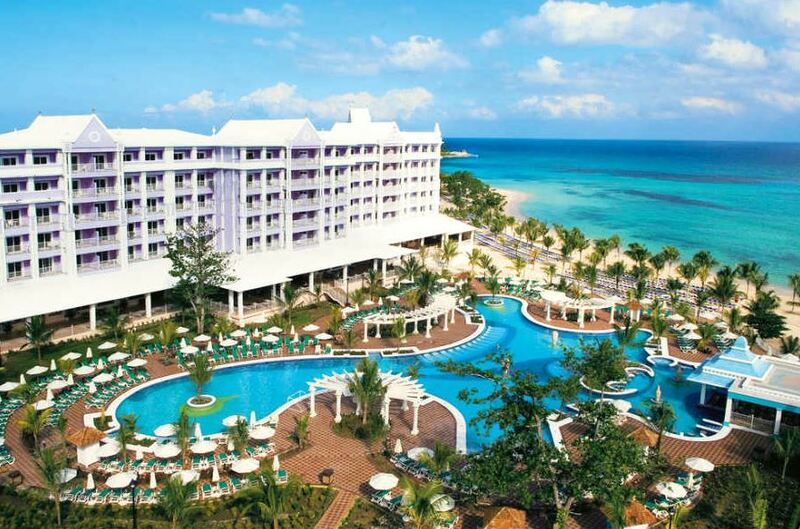 The Riu Ocho Rios is a beachfront property set in a lush, waterfall garden. They have 856 rooms offering a wide variety of accommodations from standard room with a garden view to Deluxe OceanFront Suites (with Jacuzzis for Adults Only). All rooms are equipped with kings or 2 double beds, air-conditioning, a mini-bar, TV, telephone, balcony or terrace, safe, hair dryer and clock. There is always something to do whether you want to relax by one of the 2 swimming pools or try something more energetic like windsurfing, kayaking, sailing or maybe a little golf. There’s a spa wellness centre with a range of treatments and massages. In the evening there are many entertainment options including live performances and movies. The entertainment/activities team is exceptionally good at providing fun for the whole family. There are several good buffets and a la carte restaurants to choose from with amiable staff willing to help in any way to guarantee an enjoyable stay. 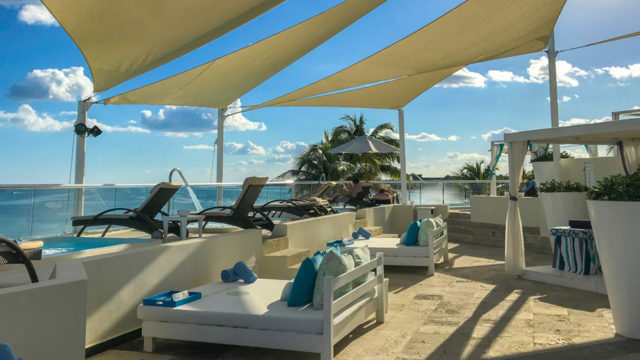 This adults-only, all-inclusive resort is all about luxury, from the private, hassle-free check-in check-out service to the 70 deluxe junior suites with canopied king-sized beds and phenomenal butler service. 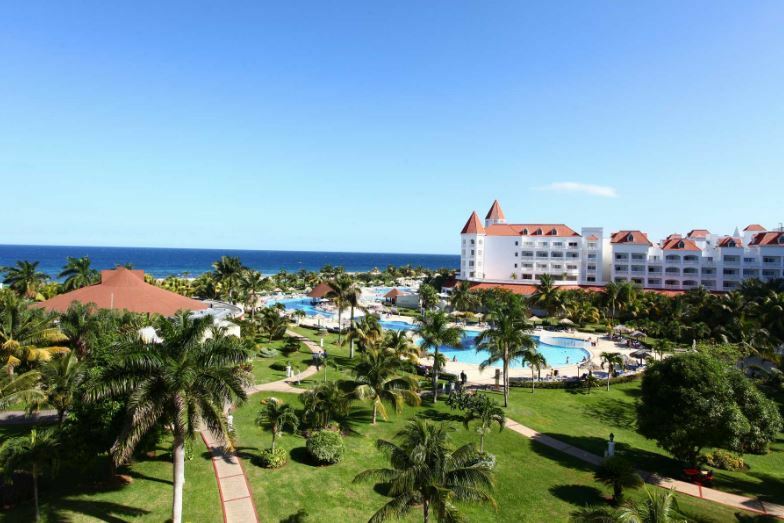 The ‘Luxury Bahia Principe Runaway Bay Don Pablo’ has wonderful architecture and décor, and the grounds are immaculately maintained, as is the beach. They have a wide range of exclusive services, on top of those of their sister resort next door: 2 main restaurants (The Don Pablo serves the best banana flambé), 5 a la carte restaurants, a snack bar, 8 bars including an exclusive Terrace Bar serving Premium drinks and 24-hour room service. The bathrooms are fully equipped with hydro massage tubs and separate showers, bathrobes, slippers, VIP amenities and hair dryers. Pool towels are in the rooms along with telephones, plasma TVs, air-conditioning, ceiling fans, coffee makers, clocks, safes and mini-bars with soft drinks, beer and water – and it’s all replenished daily. There’s a shopping area on the ‘Grand side’ that’s a bit of a walk but the bell boys, acting as chauffeurs, will drive you over in a golf cart. The true beauty of this serene resort is the fact that everything in the entire complex is made available to you: all the water sports and entertainment you could expect or you can just bask in the serenity of your quiet, luxurious surroundings. We stayed at the Bahia Principe in Runaway Bay. Please run away from this resort. The service was he’ll and our entire vacation experience sucked. We specifically asked for a room with two beds. Of course they gave us a room with one king sized bed. When they finally got around to changing our room we had to move our luggage ourselves. The employees at the excursion desk were lazy and made me miss the bus to the Falls. We could never get a reservation at any of the specialty restaurants. They constantly try to sell you a timeshare and the best beach is reserved for timeshare guests. If always thought an all-inclusive meant that you could use every part of the resort. Take my advise, Jamaica has many beautiful, well-run all-inclusiveness, but the Bahia Principe isn’t one of them.